Each bracelet features an inspirational word for daily motivation. On average, most of us don’t consume enough water on a daily basis. Dehydration can cause a variety of negative side effects, among them headaches, fatigue, irregular blood pressure, mental fog, and more. The main reason why people don’t drink the daily minimum is because they simply…forget. Funny how sometimes it’s easier to remember to put on your jewelry than drink water, right? 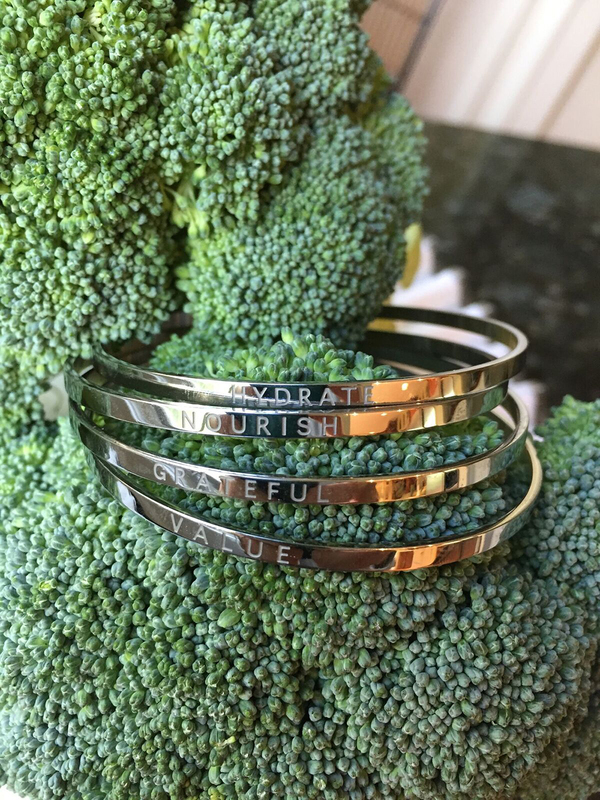 Introducing WearYourWellness Bracelets—stylish, smart and fashionable, these accessories are made from stainless steel and engraved with inspirational words to keep you motivated throughout the day. Each individual bracelet represents an 8-ounce glass of water: start by wearing all the bracelets on one wrist, so that every time you drink a glass of water, you simply switch a bracelet over to the other arm—until you reach your goal of 64-ounces of water for the day! The stackable accessories are the perfect way to stay healthy and hydrated.